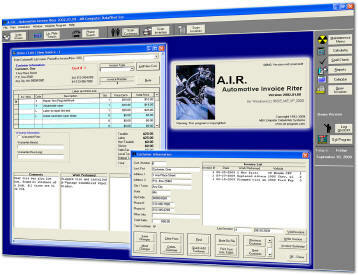 The Automotive Invoice Riter is, simply put, a program which allows an automotive repair shop to create customer invoices (work orders), estimates, print, store, edit and accumulate a customer history database. Unlike other invoice writers there is only the one-time license fee, no monthly charges, no leases, no contracts and no maintenance fee's*. To learn more, and for more detailed information click here. only pay if you call for support, per incident/issue. not required to have internet service to use the program. Simple menu system allows easy navigation. Includes utilities like a calculator, calendar and spell check. Allows multiple access levels for security. Easy to use look up features, like customer name, database license plate searches and by phone numbers. Search your customer database by criteria like city, telephone number and many more. Add new customers on the fly. Add notes to a customer file, print reminders on invoices and much more. Write an estimate, save it, print it and turn it into a working invoice when the customer returns. Just try our program, you will love it. Saves time and effort, no more searching paper records. Building customer relationships, by knowing what work your customer had done and when.